This post was a featured article in Ruby Weekly #234. It was originally published on Engine Yard. If you’re like me, you love to code because it is a creative process. In another life, I am a musician. I’ve always loved music because it represents a synthesis of the measurable concreteness of math and the ambiguity of language. Programming is the same way. But desipite the creative potential of programming, I often myself spending my days working out the kinks of HTTP requests or dealing with SSL certificates. Some part of my yearns for a purely Apollonion environment in which to use code to make something new and unseen. When I feel a void for purely creative coding, I turn to the Processing language. Processing is a simple language, based on Java, that you can use to create digital graphics. It’s easy to learn, fun to use, and has an amazing online community comprised of programmers, visual artists, musicians, and interdiscplinary artists of all kinds. In 2009, Jeremy Ashkenas, creator of Backbone.JS, Underscore.JS, and Coffeescript), published the ruby-processing gem. It wraps Processing in a “thin little shim” that makes it even easier to get started as a Ruby developer. In this post, we’ll take a look at how you can create your first interactive digital art project in just a few minutes. Processing is programming language and IDE built by Casey Reas and Benjamin Fry, two protegés of indisciplinary digital art guru John Maeda at the MIT Media Lab. Since the project began in 2001, it’s been helping teach people to program in a visual art context using a simplified version of Java. It comes packaged as an IDE that can be downloaded and used to create and save sketches. The answer: if you know how to write Ruby, you can use Processing as a visual interface to a much more complex program. Games, interactive art exhibits, innovative music projects, anything you can imagine; it’s all at your fingertips. Additionally, you don’t have to declare types, voids, or understand the differences between floats and ints to get started. Although there are some drawbacks to using Ruby Processing, most notably slower performance, having Ruby’s API available to translate your ideas into sketches more than makes up for it. When getting started with Ruby Processing for the first time, it can be a little bit overwhelming to get all of the dependencies set up correctly. The gem relies on JRuby, Processing, and a handful of other things. Here’s how to get them all installed and working. I’ll assume you already have the following installed: homebrew, wget, java, and a ruby manager such as rvm, rbenv or chruby. Download Processing from the official website and install it. When you’re done, make sure that the resulting app is located in your /Applications directory. Although it’s possible to run Ruby Processing on the MRI, I highly suggest using JRuby. It works much better, since Processing itself is built on Java. Install the latest JRuby version (1.7.18 at the time of this writing). For example, if you’re using rbenv, the command would be rbenv install jruby-1.7.18, followed by rbenv global jruby-1.7.18 to set your current ruby to JRuby. Install the ruby-processing gem globally with gem install ruby-processing. If you’re using rbenv, don’t forget to run rbenv rehash. Once it’s complete, you can use rp5 setup check to make sure everything worked. Now that we have everything installed and ready to go, we can start creating our first piece of art! There are two basic parts to a Processing program: setup and draw. The code in setup runs one time, to get everything ready to go. The code in draw runs repeatedly in a loop. How fast is the loop? By default, it’s 60 frames per second, although it can be limited by your machine’s processing power. You can also manipulate it with the frame_rate method. Here’s an example sketch that sets the window size, background and stroke colors, and draws a circle with a square around it. -size(): Sets the window size. It takes two arguments: width and height (in pixels). -background(): Sets the background color. It takes four arguments: R, G, B, and an alpha (opacity) value. -stroke(): Sets the stroke color. Takes RGBA arguments, like background(). -no_fill(): Tells Processing not to fill in shapes with the fill color. You can turn it back on with fill(), which takes RGBA values. -rect_mode: Tells Processing to draw rectangles using the x and y coordinates as a center point, with the other two arguments specifying width and height. The other available modes are: CORNER, CORNERS, and RADIUS. 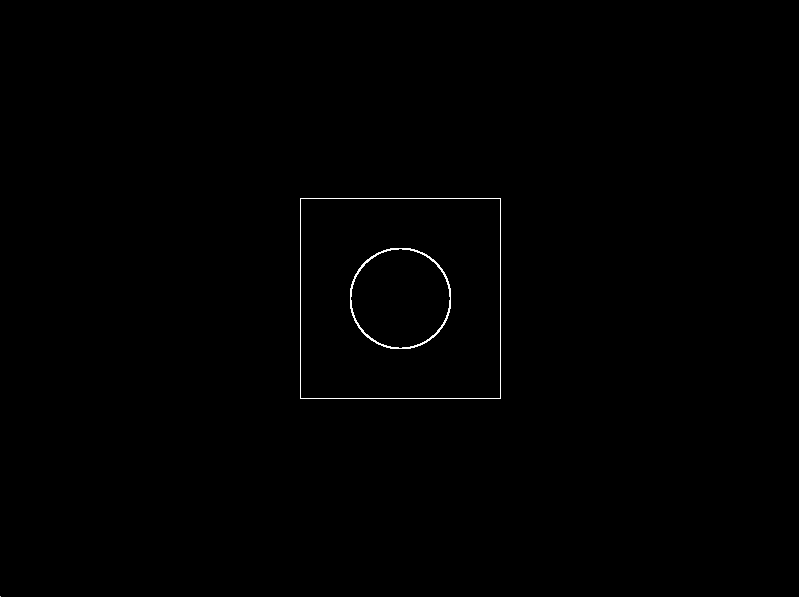 -ellipse: Draws an ellipse or circle. Takes four arguments: x-coordinate, y-coordinate, width, and height. -rect: Draws a rectangle or square. Takes four arguments: x-coordinate, y-coordinate, width, and height. Note that the coordinate system in Processing starts at the top-left corner, not in the middle as in the Cartesian Coordinate System. If you’re following along at home, let’s see what we’ve made! Save the code above into a file called my_sketch.rb. There are two ways to run your program: you can either have it run once with rp5 run my_sketch.rb, or you can watch the filesystem for changes with rp5 watch my_sketch.rb. Let’s just use the run version for now. Pretty basic, but it’s a good start! Using just the seven methods above, you can create all kinds of sketches. -line(): Draws a line. Takes four argments: x1, y1, x2, y2. The line is drawn from the point at the x, y coordinates of the first two arguments to the point at the coordinates of the last two arguments. -stroke_weight(): Sets the width of the stroke in pixels. -no_stroke(): Tells Processing to draw shapes without outlines. 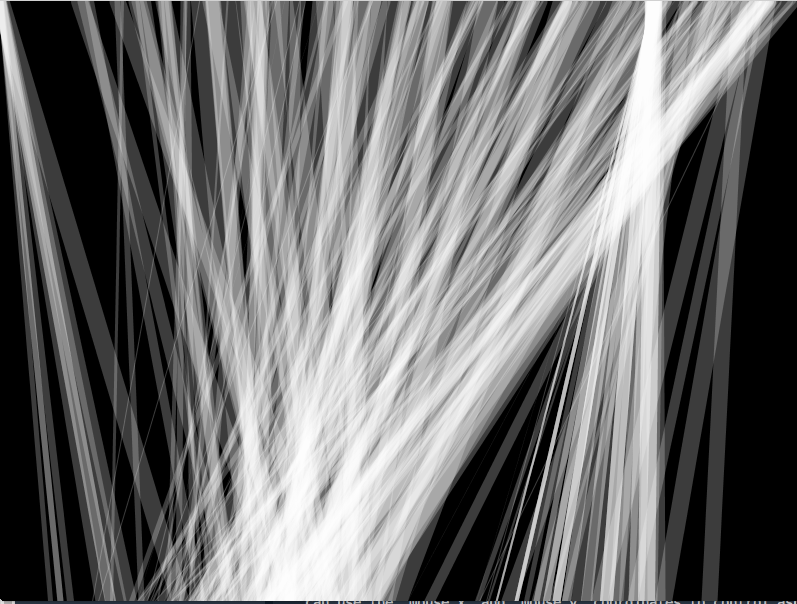 -smooth(): Tells Processing to draw shapws with anti-aliased edges. On by default, but can be disables with noSmooth(). -fill(): Sets the fill color of shapes. Takes RGBA arguments. For a list of all the methods available in vanilla Processing, check out this list. Note that the Java implementation of these methods is in camelCase, but in Ruby they are probably in snake_case. Some methods have also been deprecated, usually because you can use Ruby to do the same thing more easily. If you see anything in the Processing docs and can’t get it to run in Ruby Processing, use $app.find_method("foo") to to search the method names available in Ruby Processing. Now that we know how to make a basic sketch, let’s build something that can respond to user input. This is where we leave static visual art behind, and start to make interactive digital art. Although you can use all kinds of physical inputs to control Processing (e.g. Arduino, Kinect, LeapMotion), today we’ll just use the mouse. Processing exposes a number of variables exposing its state at runtime, such as frame_count, width, height. We can use the mouse_x and mouse_y coordinates to control aspects of our program. Here’s a sketch based on the mouse_x and mouse_y positions. It draws lines of random weight starting at the top of the screen at the mouse’s x position (mouse_x, 0) to a y coordinate between 0 and 200 pixels to the right of the mouse’s y position (mouse_y + offset, height). Load that up and check it out! One last not before we go: you can totally call other methods from within your setup and draw methods. In fact, you can even wrap everything in a class that inherits from Processing::App. You can do everything you normally do in Ruby, so you can build a whole project, with logic branches and state, that controls the visual effect through these two methods. Here’s a snippet from a version of Tic Tac Toe I built with Rolen Le during gSchool. To see the rest of the code, visit the GitHub repo. Another example of a game I built early on in my programming career can be found here. I later did a series of refactorings of this code on my personal blog. I’m still working on a pattern for game development with that I like. Keep an eye out for future posts about the best way to build a game with Ruby Processing. There’s so much more you can do in Processing than what we’ve covered here! Bézier curves, translations, rotations, images, fonts, audio, video, and 3D sketching are all available. The best way to figure out how to do a lot of sketching. Just tinkering with the methods covered in this post would be enough to keep you busy creating new things for years. If you’ve really caught the bug and want to go even deeper, check out some of these resources to learn more. If you run rp5 setup unpack_samples, you’ll get a bunch of Processing sketch samples in a directory located at ~/rp_samples. I encourage you to open them up and take a look. There’s a lot you can glean by changing little bits of code in other projects. Learning Processing is an excellent book by Daniel Shiffman. In addition to being a valuable resource for Processing users, it has a number of examples available online. Daniel Shiffman also wrote a book called The Nature of Code. The examples from it have been ported to Ruby and are another great resource for learning more. There’s a great Jumpstart Lab tutorial called Process Artist, that walks you through building a drawing program à la MSPaint. Processing is an awesome multi-disciplinary tool. It sits at the intersection of coding, visual art, photography, sound art, and interactive digital experiences. With the availability of Ruby Processing, it’s super easy to get started. If you’re a programmer looking for a way to express your creativity, you couldn’t find a better way to do it than to try tinkering with Processing. I hope this post gets you off to a great start. Good luck and keep sketching!